The Romanian assistant coach of Portland talks about his emotions before the all-important Steaua-Portland game on Sunday. 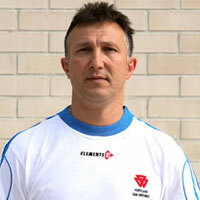 Alexandru Buligan, assistant coach of Portland, is a mythical figure of the Spanish and Romanian handball alike. He will travel return this weekend to his home country in order to get the three necessary points against Steaua. He has been living in Spain for more than 20 years, but he still always feels something special when he visits Romania, the country where he was born. Eurohandball.com talked to him. Buligan: Yes, of course. It will be a very difficult game because they are very motivated. Nobody was hoping that they would be able to beat Chehovskie and Koper in Slovenia. This match will be a matter of life and death for both teams. We need to win to stay alive in the Champions League and they will qualify if they beat us. When I learnt the draw results of our group, somebody called me from Romania and I said that the teams need to win their home games and one more as a guest. This is the actual road of Steaua and we try to stop them. Eurohandball.com: What is the secret of Steaua in Romania? Buligan: They are very motivated. It is true that they changed the technical staff and now Rudic is the new coach. It is a surprise for everybody because they won only three games of ten, but in the Champions League they showed a very different face. It is hard to explain this uneven performance in the two competitions. Eurohadball.com: What do you expect in the Steaua hall? Buligan: The hall will be full of supporters, obviously. I know that they create a very nice atmosphere and they support their team singing all the time, but it is normal. I’m happy because they cause good moments for Romanian handball. But if we play a good game, we must take the victory. Buligan: No, I played for Dinamo Bucharest, the great rival of Steaua. There are no players of my time in Steaua today. I have some friends there; Berbece and Munteanu (technical staff) played with me in the national team. There is also a younger generation in Steaua who have not even seen me playing. I am Romanian and I will be Romanian until the end of my days, but during these 60 minutes I will try to win against them.